Thomas wakes up inside a dark box. It opens to the bright light of day and he finds himself surrounded by strangers, all young boys like him. None of them knows where they are or how they got there, or anything about their old lives. They live in a place called The Glade, surrounded by a gigantic maze inhabited by terrifying creatures. Each day the strongest, fastest and smartest of the boys go out into the maze, desperately searching for a way out. Then one day, a new arrival brings a message: "Everything's going to change." Soon they are racing against the clock to find a way out before they all die. I hadn't heard of this book until I saw the trailer for the movie which came out this year. It looked like a sort of cross between Cube and Suzanne Collins' The Hunger Games so I decided to check out the book. Written by James Dasher, it's the first book of a trilogy, and ends on a massive cliffhanger with almost all of the back story still to be revealed. Unfortunately, The Maze Runner suffers a bit in comparison with The Hunger Games. It's not terrible, just a bit lacking in subtlety and world building. Overall I found the book well written, if a little slow moving. All the waiting for the main character to regain his memories and reveal what was going on got to be a bit annoying. Also, I would have liked to see more female characters, since there is only one girl in the story and she spends half of the book in a coma. She's also slim, blue eyed, beautiful and has no discernable personality. Like so many young adult books set in the future, The Maze Runner features lots of made up slang, allowing the characters to "swear" without offending anyone. It gets a bit irritating and I wish the characters would just really swear and have done with it. It was refreshing to read about a group of children surviving alone without adults who remain civilised and organised instead of descending into a Lord of the Flies type situation. However, I can't say I saw too much evidence of the boys' supposed above average intelligence. 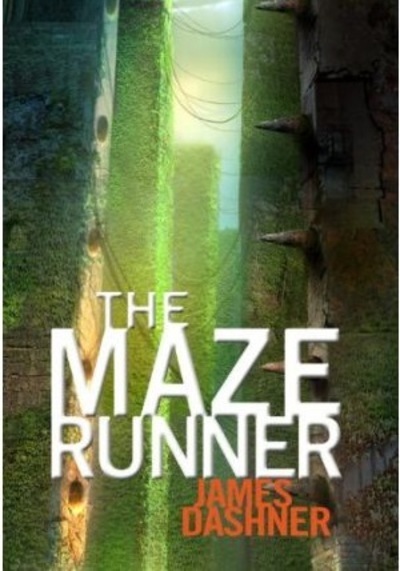 The Maze Runner is slow moving, male dominated and a little dull and silly at times, but it has an intriguing premise, so I may pick up the second book to find out what was actually going on in the first one.